If you’ve got both of those modules and an extra 8 HP to spare, consider buying both the Make Noise FxdF and a File from Control. You’ll be able to connect both the DPO and FxdF to the RxMx via the File, and swap between output modes per output jack at the flip of a switch. I’m still interested in hearing more about how people who love their Réne’s use them. I have one, and honestly I struggle with it. I enjoy using it in a pretty basic way, but given it’s size and number of controls I feel there is a lot I’m missing out on. 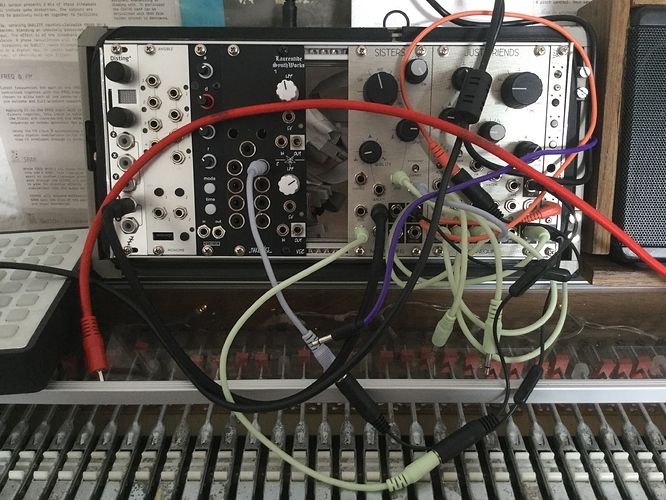 I have réne at the positioned at the bottom of 6u rack - and I’m starting to feel that it would be better broken out in a small skiff along with some other ‘control’ modules. Has anyone done this - did it change anything? Could an intrepid Cold Mac explorer explain what is going on with crease section? The demo showed it cutting out when the survey is below a certain level. Does it respond like a “standard” wavefolder if you patch subtlety or is it its own beast? I think the video actually showed the audio cutting out when Mangrove’s air was below a certain level? With something patched into crease (or slope), I think survey might no longer have an effect on the crease output? Anyway, here’s my guess on what’s going on: if you don’t patch in to crease but take output from it and send that to something you can watch or listen to, you’ll notice that you still get motion in the direction you expect, but as you cross noon there’ll be a big jump, and so you could imagine it doing the same thing to an incoming audio-rate signal, sort of introducing a bigger jump (so more high-frequency content) at each zero-crossing. I suspect that because this is an analogue design, in order to get sensible behavior, there has to be a bit of inertia near zero, so if your volume is too low, crease “can’t hear” whether it wants to jump positive or negative, so it decides to not move. I have found http://doudoroff.com/cold-mac/ to be incredibly useful in understanding what might be going on in Cold Mac. Thanks for the responses! I missed the part about survey having no effect over crease once something is plugged into the input. It’s all starting to come together in my brain. I’ve looked at the ‘Patching Cold Mac’ guide a few times and each time I read through it I learn something new. I suppose my attention to detail could be stronger. Oh, no, even with the guide and using it a bunch, it is a bit of a confounding module. Most of the more experienced users I’ve seen discussing it suggest using it for really basic functions and allowing experimentation to blossom from that, rather than trying to grok the whole thing at once. I did exactly that with moving Rene, and it was a nice improvement. And I probably don’t use the advanced functions as much as I could, too, but I assume you’ve seen the Make Noise videos on logic, etc.? I think they’re really helpful. Outing my voltage nubiness, i wonder if someone could give advice for a bipolar voltage source in my present rack. There is no generator/offset present. The disting has a precision adder but that needs voltage feeding ofc. The circular moving nature of lfo might not be ideal, or wouldnt it matter? I got a MI ears that will be added and starting with 16mm film i will use the rack for field rec and manipulation aswell. About the only thing i really think about buying is another JF (putting the passives external). But that might not be necessary Given SOS w/ w/. Can i somehow use for example an used sound out of JF or Ears and route it through the precision adder for bipolar cv? Use Disting as an LFO? It should work well. You could use something like a MI Shades, which can produce and mix bipolar voltages. Sure. But i meant inthe case as is. Is there anything i might oversee? What about even static unipolar cv? the disting might be able to produce said voltages—you should check the manual to confirm or deny for sure. Shades really is the better suggestion, though, sorry to say. One CV track of ansible (surely you’re not using all four all the time in this small rack?) sending the same note constantly through the precision adder of disting should give you a constant bipolar DC offset. Also, from the disting manual, it seems like in precision adder mode, if you don’t patch anything into X and Y, A and B should just be a positive and negative (inverted) version of the DC offset you dial in with the knob. I don’t have a disting, but shouldn’t that just be a useful voltage source for you? This might be too specific of a question, but hopefully someone here has experience with the gear in question. I want to have my Electribe 2 follow the clock of PNW (or vice versa) but I’m not sure which settings (on either!) will make it so they are both utilizing the same type of gate. Every time I hook one to the other, the tempo is all off. Anyone know what I should set them to so they are speaking the same language? Thanks and sorry for all the parentheticals. Dunno why i missed that. Didnt try hard enough i suppose. Thanks a lot!! maybe a frap tools 321? I use it to bipolar-ize unipolar signals all the time, amongst many other utility uses. makes it’s way into every patch. i recently built a small system (Tiptop HEK) to make noisy / percussive / tonally varied / free-form sounds, drones, etc. Before going with the HEK, i grabbed a Rubicon (mk1) from Analogue Haven, at a healthy discount. i was thinking that i might go with a Mantis case, so module size wasn’t an issue. now that it (space) is an issue, i’ve been looking at smaller voice modules, and am thinking about trading the Rubicon for a Loquelic Iteritas, which can get quite noisy and extreme-sounding, quickly. while i do like some of the timbres, i’m wondering if it can be reined in a bit, possibly achieving more tenuous / delicate sounds (in the upper register), and still be aggressive / extreme etc. for gnarly, lively drones. I do like its immediacy, or what i perceive it to be – immediate, hands-on, characterful, etc.